Patagonia made some pretty big waves in the tenkara-verse last week with the introduction of the "Simple Fly Fishing" tenkara product line. Aimed at introducing people to a less cluttered version of fly fishing, the products can be bought a la carte, or bundled in a kit which I'm sure will be very attractive to many people, especially those getting into tenkara (or even fly fishing) from the ground floor. All that for $279.85. Sounds like a pretty good deal, right? But that kind of got me to thinking...what would a similar package cost from Tenkara USA? 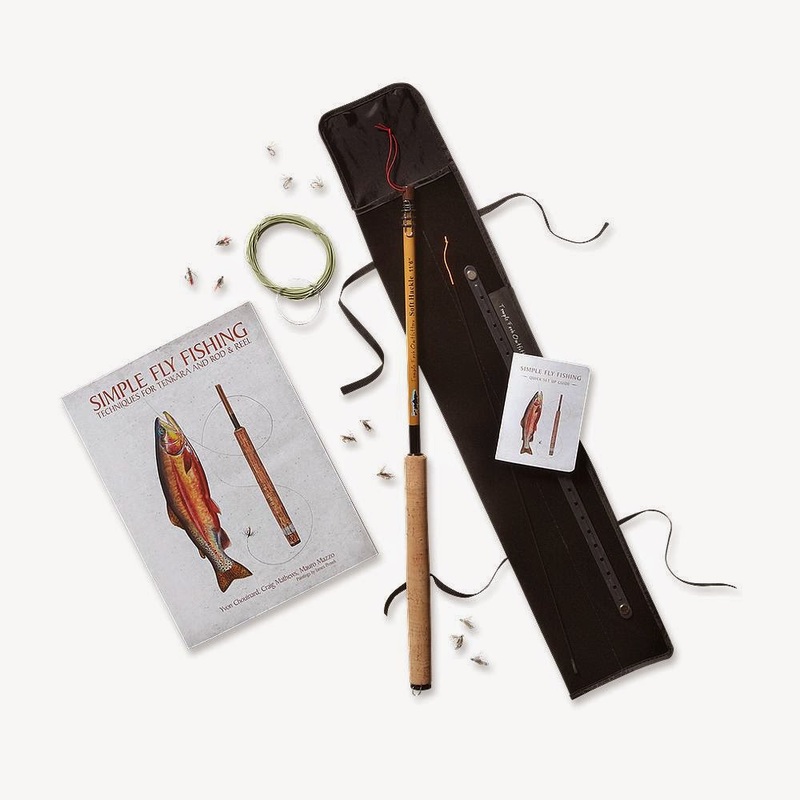 Tenkara USA has been offering a starter kit via Orvis for a few seasons now that retails for less at $215, but that includes two different lines and is centered around the Tenkara USA Iwana model rod. While there is nothing particularly wrong with the Iwana, I was more curious to see what a package with the new Tenkara USA Sato & Rhodo rods might run since they have some added features such as the three-way zoom and the "keep your plug" system that neither the Iwana nor the TFO-produced Patagonia rods possess. All that totals $259.90, about $20 less than the Patagonia kit. But hey, wait a minute...the Patagonia kit also comes with a tapered leader and a book! Yep, even though Tenkara USA has a very extensive "how to" section on their website that you don't have to pay anything for, I should probably add at least a spool of tippet and a how-to book to make the comparison "apples-to-apples"...in this case since Tenkara USA doesn't sell either, I'll source both from good ol' Amazon. ...which is basically the same as the Patagonia kit ($279.85). Yeah, I guess you're 6 flies and a spare tip short in the Tenkara USA package, but you're probably more than offsetting that by having a rod with more features and 3 different fishable lengths. The choice seems simple to me. I am aware that there are other very viable options for tenkara starter kits out there such as THIS or THIS that are even less expensive than the two outlined above. Finding the most inexpensive option wasn't really the point of this post...as that exercise could go on to no end. Purchase decisions should come down to personal choice and this post is not an indictment in any shape or form of Patagonia/TFO product. That would not be fair since I have never used them. That noted, I have been more than happy with all of my Tenkara USA gear dating back to 2009. Still way out of my price range. Thanks for the post though. Good to know what's out there. Badger Tenkara can get you Tenkara fishing with complete kits for $120! Yes, as noted in the Postscript, there are numerous options for less expensive kits. I called out two (of many) that were far less than the ~ $280 Patagonia & Tenkara USA examples. Since I'm friendly with the folks at Badger Tenkara on social media, I'll leave this comment up, but please don't use the comments of this post for solicitation. I'll have to freeze them, and I don't want to do that. Thanks. Fair enough, it won't happen again. This a great review of these two options. "That noted, I have been more than happy with all of my Tenkara USA gear dating back to 2009." Me Too. I agree with Joel (I an not a paid spokesman :-) Nor am I. Although tenkara wasn't something I decided to stick with - I agree with the others - Tenkara USA's rods were more than adequate ( read: really nice ) and they stand by their product. Companies like Tenkara USA and NuCanoe are forging new business and taking customer service to the extreme - something I think every company should be doing in this economy - but many are not. We'll see who survives in the end. I've never owned Patagonia gear - they're too closely tied to Sierra Club and the radical eco movement for me. Damn radicals. You're the best Owl. Well done article. TenkaraUSA is my choice the gear is top quality and the customer service is excellent. Tenkara USA does have great customer service. No doubt about it. To Patagonia's defense, they do have a "Iron Clad" customer service guarantee. Also, if TFO is servicing any repairs, they will be turned around quickly. I broke a TFO (non-tenkara) rod in the past, and had it repaired and back to me in about 3 business days. Not too shabby. So I was wondering if you have done any reviews for a Tenkara size rod for your daughter? I'm interested in getting my 8 1/2 year old son to try it but think the Iwana 11' is too long. Lilly has kind of given up on fishing. Karate & roller skating are her things at the moment. I'm not going to push it at this stage, so we haven't done the tenkara thing. It's fine with me. That said, since you asked, if you feel the 11' is too long (I might disagree BTW) TenkaraBum offers some rods that are kid sized and fairly inexpensive. One is under 8' the other under 9'. Either way, good luck! I think your son could more than handle an 11' Iwana, but options abound otherwise. Thanks Michael for the links. Yes I will try him out on the Iwana at some point. Probably on the Wissahickon or Stony Creek. Just finished the book. Beautiful photography, great 'slice of fishing life' stories. Minimal usefulness as a guide to getting any fishing done. I'm not sure what Yvon and his co-authors were trying to do with this, but they probably haven't succeeded. Sorry the book didn't "work" for you. I'm looking forward to reading it, I welcome the different point of view. I just wish the Kindle copy wasn't lagging behind the print copy! I should probably note that I have no issues with Patagonia entering the tenkara market...their kit looks very complete - contains everything top to bottom - and I'm certain they'll service their customers right just in case anything comes up (I know TFO has great rod warranty service - I used it once on a regular fly rod). So I don't think customers can go wrong if they are interested in simplifying their fly fishing. That noted, I was simply surprised that I could get a comparable package from Tenkara USA with an Sato or Rhodo for the same price. With those being premium rods, I thought for certain it would cost more. Good review as always, meant to send you an email this week but I suppose this will suffice. Finally ordered the Tenkara USA Iwana kit you recommended to me a few months ago. Can't wait to get it. Thanks again for your help on that. I love the new sato and think it's by far one of the best values in tenkara. Great post by the way my friend. Hello Mike. You can start tenkara fishing for 79EUR= ~89 USD. Pay your attention to http://www.tenkaratimes.com/tenkara-gear-storefront/tenkara-starter-kit. HI, I'm new to fishing, even though I'm 51. But have always wanted to try fly fishing. I have a gift card from Patagonia for close to $200 so was going to blow it on the longest tenkara rod kit. But I really like what I'm reading on the Tenkara USA website and in your review. So, I'm torn. I do like the idea of variable rod lengths, so the T. USA rod sounds much better. But honest I've had my gift card for over a year and just don't need any Patagonia gear. I love Patagonia, just don't need anything. If I go with T USA, I'd have to wait to save up the money for a kit. But if I use my Patagonia gift card I can get it now. I guess the question is ... do you think that they are fairly similar kits? Geo, if you've got the free $$$, it would be hard for me to talk you out of the Patagonia kit. Yes, the Tenkara USA zoom rod is probably more versatile, but free $$$ is free $$$ and the rod in the Patagonia kit is more than serviceable to get you going on your tenkara journey. There are plenty of people that are extremely happy with their Patagonia purchase. I will note that I've never fished the Patagonia rod...I've heard it's a little stiff, but made that way intentionally to best cast the PVC line included in the kit. Thanks Michael! Decision made, Patagonia it is. And if, as I expect, I get 'hooked' I'll buy a Tenkara USA rod later. Another question though ... I just found out today, that local fishing and outdoor clothing store is going out of business, and they are offering tons of fly gear, line, flies, vices, etc, etc for 30%-70%. So, question is can you think of anything I should pick up a good discount?? Only thing I could think of were waders, but they didn't have my size. A net would be nice, but there cheapest one was $80, too much for my small budget. Should I pick up extra line, flies, etc? Oh, that's a dangerous question. Don't know what you have already, but this is a short shopping list of gear you might find helpful. None of it is particular expensive on its own, but would add up if all bought at once. If nothing else, get an extra spool of tippet (or extra leaders) & a pair of nippers (if you don't have already)...you never know when you're going to run out. - Spool of tippet (5X or 6X) or tapered leaders...whatever comes with your kit. Great ... that helps a lot. Aside from normal outdoor gear [fanny pack and sunglasses, but not polarized] I have NOTHING for fishing. Last question (for now) ... Patagonia has three rod lengths: 8.5' 10.5' and 11.5' I think I read that the shorter one is mostly intended for kids. So, should I get the 10.5' or 11.5'??? I know the answer may depend on type of fishing, type of fish, and location. But know that this will be my first experience fly fishing [and very little reel fishing] and will be fishing in streams/rivers in northern Vermont [near Burlington, VT], likely the Winooski, but will also, if possible, want to fish elsewhere, like Lake Champlain. In short I want the rod I get to be as versatile as possible. Thanks so very much for your advice. I hope your answers are helpful to your other readers too! I can't wait to get out and try my hand at Tenkara fishing. I'll explore the rest of your blog. It feels like I'm opening the door on a whole new, fascinating and exciting world. Any final pieces of advice for this new tenkara fly fisher are appreciated! BTW, that picture of Lilly is adorable. I've got two boys going into high school [9th & 10th]. I feel like a few years ago they both expressed interest in fishing [reel], but my lack of interest translated into them doing it mostly on their own and the last couple years not at all. I think my new interest in tenkara has got their interest rekindled a bit ... I hope so!! Because the last couple years [middle school] has had them pushing to only hang with their friends and NOT mom & dad ... which is normal and respected/supported ... but still sad! Anyway, I hope you get to spend lots of time with Lilly because when she gets older it may decrease. Thanks again!!! Not sure. I'd go 11.5'. Would only go shorter if you're concerned with overhanging trees. But really, the difference between 10.5' and 11.5' is minimal when you're actually fishing the rods. So the extra length may come in handy. Good luck & have fun!